Location: On compact site on the southern side of this north-eastern arm of Mount Stuart Square; on the corner with West Bute Street. 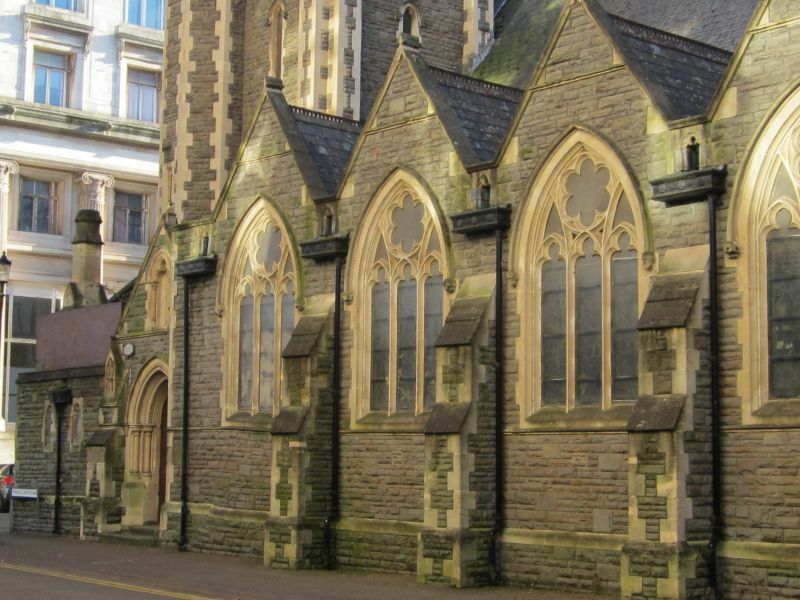 Built in 1900-02 by Col E M Bruce Vaughan, architect, of Cardiff; replaced a temporary cast-iron church erected in 1878 by James Seward and Thomas. Foundation stones laid April 5th 1900. Enlarged in 1912 again by Bruce Vaughan. St Stephen's was a Chapel of Ease to St Mary's Church. Gothic - C13 style. Design dominated by bell-tower set close to NE corner with shingled octagonal spire, polygonal vice and machicolated style parapet. Single-naved church with transverse-gables on N side forming aisle. Snecked rubble with buttresses and freestone dressings including gable parapets with finials; slate roof and cresting. Gabled porches with boarded doors to E and W ends on N side, the main one being that to E with cusped arch surround to 2-order, dog-tooth moulded entrance; chimney stack to corner by simply chamfered W porch. 1-bay added to E end, beyond tower, in similar manner. 3-light windows to gables, with sexfoil oculi and stopped labels; sexfoil clerestory roundels behind the gables. 5-light windows to W and E ends with stepped-up central lights. Gable end set back to left at E end with 2-light window and similar 2-order arch entrance. Converted for theatre use, with cafe/bar, box office, storage etc. Nave formerly of 6 bays, pointed arches, visible shafts round with dogtooth capitals. Masonry painted dark blue. Arch-braced roof. Aisle bays with transverse roofing. Windows obscured except at E end where 5-light window lights cafe/bar inserted at first floor level. At foot of stairs to cafe/bar, triple sedilia in C14 style. Listed for value of exterior to prominent corner site at entrance to prominent corner site at entrance to Mount Stuart Square, and group value with neighbouring listed buildings.